Most business people are hard-nosed and soft-hearted. This has been my experience in trying to galvanise corporate support for social development over the past 25 years. These are exactly the attributes needed to find economically sound solutions to the country’s social problems. However, corporate professionals often act as if head and heart were disconnected: they give generously in the face of human need, but don’t apply enough of their business mind and muscle to bring about fundamental social change. Our country needs more acts of compassion, but it also needs a better reticulation of social development and economic practice. Nowhere is the case more compelling than in support for young children, who are the source of human capital and hold the key to long-term economic success. Investing in their well-being and early learning is the most powerful investment in human capital formation that a nation can make, but young children need champions who can speak up for them. They don’t have the vote and don’t burn buildings, yet they hold the greatest power to make our country prosperous – if only we unlocked their economic potential instead of wasting so much of it. The great thing about the business sector is that it sees opportunity where others see deficit. Arguably, our neglect of young children is the single biggest reason for unemployment and unemployability in South Africa today. If we paid attention to their basic needs – food, love, safety and stimulation – our long-term economic prospects would be far brighter. The cost of that investment is small relative to the returns. For instance, the Global Child Development Steering Group found that every rand spent enabling a child to thrive before they go to school generates at least ten rand back. This significant opportunity is well illustrated by the South African Early Childhood Review published in early May 2016. It showed that children’s lives are generally getting better, but not enough to effect the tipping points that the country so desperately needs. Roughly one million babies will be born in South Africa this year. By 2019 – just three years from now – a quarter of them will be nutritionally stunted i.e. short-for-age. A study published in the Lancet in 2008 followed cohorts of children into adulthood in five different countries (including South Africa). It found that children’s height at two years of age was the best predictor of adult human capital. Stunted children performed worse at school and were less economically productive as adults. But encouragingly, if they got extra food and intellectual stimulation, their earnings potential increased by 25-40%. A common refrain from financial investment managers is that the 3.5% of GDP spent on social grants is a drain on national productivity. While it does represent a significant social wage, the child support grant is the main reason for the decline in the proportion of children living in poverty (from 79% in 2003 to 63% in 2014). At R350 per child per month, the grant is still below the food poverty line deemed to be the absolute minimum required for sufficient nutrition. 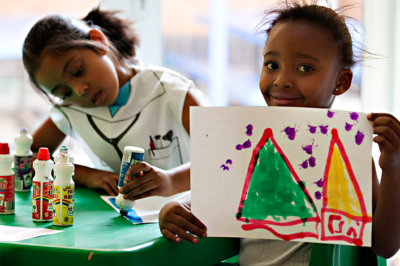 Early learning represents another significant opportunity to reshape South Africa’s economic future. If young children participate regularly in early learning playgroups or centres, their brains develop better and they do better at school. They experience compounding cognitive and linguistic gains that describe an exponential path towards adult achievement and productivity. A 2010 study by the Department of Economics at the University of Stellenbosch found that the GDP in South Africa would be about R550 billion higher if all South Africans were sufficiently literate to participate in the formal economy. Even half that projected benefit would still equal the total annual public spending on education. Yet only 50% of children under five in South Africa participate in out-of-home early learning programmes. If the other half had similar opportunity, they would enter school primed to learn and dropout rates would decline sharply over the next decade. The benefits of early childhood development extend beyond education and economic growth. The self-regulation that it produces results in significantly less crime, less adolescent risk-taking and greater public safety. In consequence, it promotes social stability and reduces the cost of doing business. As our nation looks to get out of the current social and economic mire, we can no longer ignore the economic value of young children. Over the past decade, the corporate sector has invested considerably in schools, and recently we have seen big business galvanize in support of higher education. These commitments signify a growing convergence of public and private interest in the future of the country. But any hard-nosed assessment of their potential impact will show that these substantial capital outlays will be largely wasted if we do not invest properly in young children at the same time. No serious captain of industry would build his or her company’s future on an inadequate foundation. Yet young children continue to live in our nation’s collective blind spot. In the United States, over 100 top chief executives are part of ‘Ready Nation’ which aims to improve business competitiveness by helping children get a good start in life. Similarly, senior business leaders in South Africa need to rise to the challenge. mobilise a national network of care and support to the quarter of a million babies at greatest risk. Gradual changes in the state of education and economic possibility for young people may not be enough to prevent South Africa from becoming trapped in a low-growth, low productivity state. We now need tipping points, not incremental progress over decades. A new mission for young children – driven by business leaders – may be just the impetus we need. Thank you for highlighting the importance of connecting the head and the heart. Your views are so valid, and it is so valuable to have a platform like the Business Day to get your views heard. I am studying for an M.A in ECD online at Roehampton, and I am currently involved in a module on professionalism and leadership. You exemplify what it means to be a compassionate leader. Thank you for all the work you are doing to ensure that the voiceless are heard. Hi Kathryn, David asked me to drop you a note thanking you for your kind words, he really appreciates it. Hi Chantell – Thank you for your comment, David is on sabbatical at the moment, he will be back at the office in a week or two. In the meanwhile you are welcome to reach out to our programmes team by writing to info@dgmt.co.za. We definitely share your sentiments about breastfeeding. You could also try to reach out to one of our implementing partners, Cape Town Embrace (http://www.embrace.org.za/). They are trying to get a citizen movement going to support pregnant and new mothers – they share your passion as also!